Last week, we featured the début marathon of Kayoko Fukushi of Japan. As the fastest Japanese woman ever over the HALF MARATHON, much was expected of Fukushi’s debut marathon in Osaka, but in the end, she left the world with memories of a different kind – 15 minutes to cover the final 2km, three falls in the final 300m in the finishing stadium, and testament to the challenges posed by the marathon distance. In the aftermath of the race (you can watch the final 400m, as well as our analysis of the race at our previous post), Fukushi’s final 400m was a hot topic on discussion boards and running websites. So in this follow up post, we thought we’d look back on other famous marathon finishers. We tip our hats, and our physiological paintbrush, at the following three famous “Marathon survivors”. In 1984, for the first time, women were allowed to run the marathon at the Olympic Games. The race was won by Joan Benoit, in a remarkable time of 2:24:52, beating off a stellar field including Weitz, Kristiansen, and Rosa Mota. The time was remarkable for a number of reasons. Not least of all, conditions in LA were hot and heavy – ahead of the Games, there was a great deal of anxiety over potential problems caused by the pollution – much as there are around the Beijing Olympic Games this year. But in the end, the heat caused the problems, and the biggest problems of all were encountered by Gabriela Andersen-Scheiss, of Switzerland. Andersen-Scheiss entered Olympic Games AND Physiology folklore thanks to her performance over the final 400m of the race. This video, shown below, is often shown at physiological conferences as a demonstration of what happens to the physiology when the body temperatures rises to reach a ‘critical threshold’. What you will see in the video below (apologies for the poor quality – if anyone has a better version, let us know! ), is that Andersen Scheiss enters the stadium clearly in distress, and over the next 400m, staggers around the track, taking an incredible 5 minutes to cover the final lap! The video edits out much of this last lap (again, let us know if you know where a better version exists), but you can get a good idea of just what is wrong – it seems as though the left side of her body is dragging the “paralysed” right hand side behind it. And this is typical of what happens when the core body temperature rises to above 40 degrees Celsius. We’ve brought this up before, but it bears repeating – until the mid to late-1980’s, the theory for exercise in the heat was that you fatigued because the body was unable to provide sufficient blood to the skin for cooling AND the muscles for exercise. In this theory, dehydration was a problem because it meant less blood, which only worsened the problem. But in 1979, Ethan Nadel found the first evidence that the blood flow was not the problem. This finding was repeated in numerous studies, where they found that the body was perfectly capable of getting enough blood to muscle and to skin. However, the body temperature can still rise (this is a function of exercise intensity and the environment), and when it happens, the evidence began to suggest that the brain was involved. Why? Because scientists started to observe that when people in LABORATORIES hit a body temperature of 40 degrees, they started to display symptoms of neurological problems. Which is exactly what you see in Andersen-Scheiss – “paralysis” of one half of her body, inability to control the limbs, and so forth. This classic symptom was strongly suggestive of the neural contribution to fatigue. It was later found that when the brain gets too hot, it actually recruits less muscle (Nybo and Nielsen, 2001). Of course, when you exercise in the heat, it’s not quite as simple as a brain the stops activating muscle when you get too hot – I (Ross) did a study in 2004 that found that the activation of muscle actually goes down BEFORE you get too hot. In other words, the brain slows you down by activating less muscle IN ADVANCE of hyperthermia, specifically so that you don’t reach this point of complete exhaustion and ‘paralysis’. However, as the video above testifies, it happens, with dramatic consequences. Andersen-Scheiss, for her part, became something of an Olympic legend as a result of her courage. She ended up finishing in 37th place, some 20 minutes after Benoit. She was treated and released within 2 hours, showing how even the most intense effort is probably still within the reserve capacity for the body. Jim Peters of England was the Paula Radcliffe of his generation – he had broken the world record four times and was the first man to run under the 2:20 barrier, taking the record down by an astonishing eight minutes to 2:17:39! So when he lined up in the 1954 Vancouver Empire State Games (today called the Commonwealth Games), he was the overwhelming favourite. This was the same Games, incidentally, that Roger Bannister and John Landy raced in what would later be called “the mile of the century”, with Bannister outkicking Landy to win. 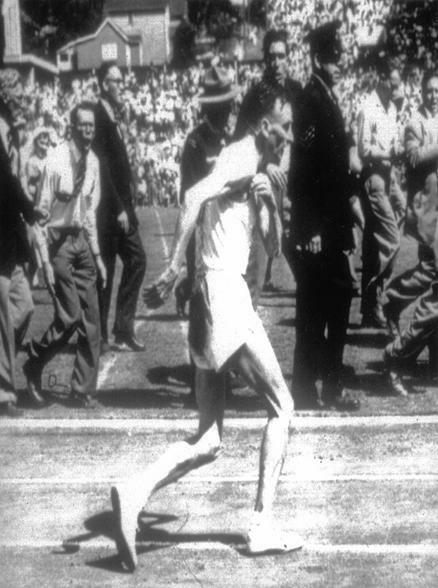 That race actually happed while this marathon was being run, and so Bannister actually sat in the stadium waiting for the men to finish. Anyway, the marathon that day was particularly hot, and Jim Peters staggered into the stadium in first place, but was looking like he’d had too much to drink. He was swaying from side to side, and it looked as though one half of his body had been paralysed – much in the same way as Andersen-Scheiss would look 30 years later. The conditions in Vancouver were pretty warm with starting temperatures in the shade in the high 20′s Celsius. Reports were that the sun was so warm that the tar melted during the race! The temperatures may not jump out as being exceptionally high for those in the hotter parts of the world right now, but given that most of the athletes were not adapted to the heat, it was a tough day in the marathon. The conditions were so severe that out of 16 starters, only 6 finished the race. Jim Peters was not one of them. After entering the stadium, with only 385 yards to run, Peters fell SIX TIMES within the first 200 yards. He took 11 minutes to cover that distance (making Fukushi look like a greyhound in her race! ), before eventually collapsing for the final time – 200 yards SHORT of the finish line! He was taken to hospital, where he spent 7 hours being treated intensively before being released. Incidentally, the athlete who was in second position with about two miles to run, Stan Cox, had also collapsed and ended up in hospital. At the 25 mile mark, he was so disoriented that he ran into a lamp-post, collapsing again. Eventually, police helped him to an ambulance, and he was taken to the hospital, where he’d later be joined by Peters. And then finally, the eventual winner was a Scot, Joe McGee, who had actually collapsed five times on the course as well! But he heard that the two men who had been in front of him failed to finish, he picked himself up and went on to win! An attritional race if ever there was one! And finally, for perhaps the most dramatic video we know of, we go to the IronMan Hawaii Triathlon of 1997, where Sian Welch and Wendy Ingram “race” over the final few hundred meters for fourth and fifth place. This video, shown below, is difficult to watch, for the sheer agony that I’m sure most of you can relate to in some manner. It’s absolutely remarkable because it shows two elite athletes, both struggling with a combination of fatigue, muscle cramp and in the case of Welch in particular, hypoglycaemia. It’s quite clear that she’s in a disoriented state, and struggles to balance, find direction and stay co-ordinated. Wendy Ingram, for her part, is cramping quite severely, and modifies her running style drastically in the final straight before the finish line. What is most amazing, from a physiological point of view, is that the women move through different stages of what I would call “muscle activation patterns”. It’s as though there is a Plan A, which is to run absolutely normally, finishing strong (like some of the men who are finishing at around the same time as these two, you’ll see them in the background). But given the difficulties both are experiencing, the brain quickly switches over the Plan B, which is this “modified running technique” – anything to keep going forward. Ingram’s “spider walk” is amazing, she’s clearly putting everything she has into what looks an incredibly uncomfortable running style! Welch is unable to do even this – her muscles have simply been “switched off” and she has nothing left, mostly as a result of the low energy she has available and her fatigue – tired muscles with little fuel, and the brain says “No chance you’re running any more!” She’s unbalanced, uncoordinated and out of control. Eventually she staggers and walks to within meters of the finish line – she is on Plan C. But then she falls, taking Ingram down as well. And you’ll see in the video, the eventual winner between the two of them is the one who first realises the need for Plan D – Crawl! So it’s an astonishing video, and you’ll hear reference to Julie Moss, a link you’ll find in the comments section of our Fukushi post from last week. But this finish, and these two women, must surely go down as one of the bravest and most courageous, dramatic finishers in history! Can you ever overcome the body’s limit through sheer willpower? One question that is often asked when this whole area of “limits to performance” is discussed is this whole issue of “mind over matter”. What we are saying is that brain decides when “enough is enough”, and reduces the activation of muscle fibers BEFORE you even get near the dangerous levels of body temperature or fuel depletion, for example. The logical question, however, is “Can an athlete, through sheer willpower, find that little bit extra, over-ride the brain’s protective reduction in muscle activation, and allow the athlete to go that little bit faster?” Professor Tim Noakes, who is one of the primary drivers of the theory of the brain protecting the body, often talks about the psychology and willpower aspects. And while they are relevant, I feel it’s not quite correct – it’s not simply a case that the guy who wants it most will win, which is unfortunately the spin that is often put on it. So the answer is complex. Certainly, willpower and psychology play a role, and different people will tolerate different levels of discomfort. But I think that what these videos and stories show is that eventually, physiology wins the day. Peters, Welch, Andersen-Scheiss, and Ingram are all examples of athletes who have dug deep, found EVERYTHING their physiology has to offer, and quite literally run to the “edge of the limit”, but eventually, their physiology shuts down so completely that they simply could not run anymore. And yes, they survived. So in that sense, the brain did its job of protecting them, because all made recoveries, none “exercised themselves to death” (this happens, but it requires some special circumstances, we’ll discuss that in a future post). So, to use a morbid analogy – no matter how badly you want to go, you cannot commit suicide by holding your breath – physiology wins. And similarly, during exercise, your willpower can take you that little bit closer to the limit. In fact, training takes you nearer that limit, since you learn what is tolerable and what is not. Motivation is of course important here too – given the right motivation, you might be prepared to tolerate a lot more than usual! But as you approach that “limit”, your body begins to progressively throw barrier after barrier in front of you. It becomes more and more difficult to hold the pace. Your brain is not activating muscle at the same level, and your perception of effort rises and rises. And eventually, physiology wins the day, and you stop, either voluntarily or because your legs fail to hold you up any more. This is human performance at the very extremes, but it’s still physiology! Join us for exercise in the cold next post!